Basically I had been giving the Iceland economic 'problem' a rather wide birth (until today that is), since I think it is, when all is said and done (and with full apologies in advance to all Icelanders), 'pretty small lava'. In addition since my "global imbalances" theoretical model doesn't follow the well-trodden Roubini-Setser path, and since underlying euro weakness means that the dollar can't possibly fall in any dramatic way over the longer term, and since I don't find it necessary or desireable to treat every fresh crisis as just one more example of my own pet thesis, and since anyway I have enough on my plate right now, I thought, well, let's give this party a miss. There will be plenty more later. (For those who have missed out Brad Setser has been posting on Iceland here. Basically I have been arguing for ages with Brad that his work - which tries to address the imbalances issue without any reference to the underlying demographics - is rather like putting on a performance of Hamlet without the presence of the Prince himself. What you end up with is a good deal of interesting data, but with no theoretical model to put it all together around. And then there is the 'next crisis is around the corner-ism' of Nouriel Roubini which seems so much to drive things. My guess is that the next crisis may eventually come round the next corner, and it has a name: Iran, and what this could do to global oil prices, and what a huge spike in global oil prices could do to an already extremely weak and debt-ridden Italian economy, which is, IMHO, the weakest link in the global chain, but then, this is not an economics blog, and this is only a guess, perhaps it would be better if I try to keep to my promise to myself and stay away from all this here). "The Icelandic krona’s sharp fall, which put it at a 4½-year low against the euro on Tuesday, has provoked debate between political and business leaders about the country’s possible membership in the eurozone". "Carsten Valgreen, chief economist at Danske Bank, said the small size of the Icelandic economy and its heavy reliance on a small number of industries left the country exposed to global market fluctuations, whether it joined the euro or not. “The advantage would be that the credibility of monetary policy would increase,” Mr Valgreen said. “But you should also ask yourself whether a tiny economy in the middle of the Atlantic, largely based on fishing and aluminium, is really aligned with the eurozone.”"
Live births in Iceland were 4,280 in 2005. Total fertility rate was 2.1 which is higher than in most other European countries. Turkey is the only country in Europe with higher total fertility rate than Iceland. The total fertility rate has remained relatively stable in Iceland since the early 1990s. During the 20th century total fertility peaked during the 1960s to a rate of 4.3. In recent decades Iceland has experienced pronounced increase in the age of mothers at childbirth. In the late 1970s the mean age of primparas was 21.3 as compared to 26 in 2001-2005. During this period, age-specific fertility in the age groups under 25 has declined considerably whereas fertility above the age of 30 has increased slightly. The share of extra-marital births is higher in Iceland than in any other country of Europe and in 2005 almost two thirds of all children were born out of wedlock. The majority of these children were born to parents cohabiting and only 14.4 per cent of all mothers were not living with the child’s father. The share of extra-marital births is considerably higher in the case of first births than with children of higher parity. Now here we can see four things. (i) Fertility is currently near replacement level. (iv) There is a level degree of cohabition. Now (ii) is normally a low-fertility indicator, while (iv) is normally associated with slightly higher levels of fertility. (iii) is consistent with a slow process of birth postponement, with TFRs rebounding slightly later, as the 'missing births' appear. So then I went and checked my lists. Iceland currently has a fertility (TFR) of 2.0, it has a life expectancy of 80.19 (which is comparatively high), and it has a median age of 34 . Now it is this latter median-age data point which produced the wow sensation, since this is very young, and puts it in the same zone as the United States, Ireland and New Zealand, ie by median age it is the archetypal country par excellance to be having the kind of credit/housing driven boom, and balance of payments deficit it has been experiencing (that is according to my 'stylised facts' version of events). This is something I hadn't picked up on before, so I took a look at the age pyramid, and sure enough it looks remarkably solid (Iceland even had minimal, but significant, inward migration last year, 3,860 in 2005). So there we are, one problem more or less resolved. Iceland is not fundamentally unstable, and isn't about to collapse anytime soon, run on the krona or no run on the krona. 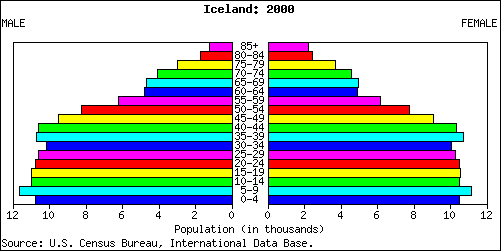 Iceland probably needs to edge the retirement age upwards to compensate for the increasing life expectancy, and invest plenty in education and broadband internet connections, then they might find that being 'a tiny economy in the middle of the Atlantic' isn't really as bad as some people think it is. Of course none of this means that Iceland might not consider at some stage joining the European Union, but that, as someone once said, is another country. The change in the krona has more to do with hedge fund flows, which are related to global issues, notably Japan, and little to do with the long term prospects of the Icelandic economy. BTW, it's nice to see you have a different perspective than Brad and Noriel. The funny thing about crying wolf all the time is eventually you'll be right. Even broken clocks are correct twice a day. Unfortunately, people listen to all there noise the rest of the time. "The change in the krona has more to do with hedge fund flows, which are related to global issues, notably Japan,"
Oh absolutely, I completely agree. Which is why I don't think anyone should be drawing any very important conclusions, or making plans to join the euro etc etc. OTOH the Japan situation is to do with demographic issues, and my guess is that (especially now oil is spiking again) interest rates in Japan isn't going to break free from the zero band anytime soon, and the carry trade therefore isn't going to unwind the way some (Brad and Nouriel eg) imagine it is going to. The big point is that the global demographic imbalances are preventing any 'dollar correction' by limiting the slack for upward movement in the currencies which would allow it to correct. "The change in the krona has more to do with hedge fund flows, which are related to global issues, notably Japan, and little to do with the long term prospects of the Icelandic economy." Yep, I also agree here and Iceland is not the only country seing a run on its currency; other small emerging markets are as well. The question obviously is here whether Japan will raise those rates to unwind the carry trade and crucially whether the same dynamics can be applied to USA. This is not very likely I suppose and ultimately it is because the dollar is different beast entirely than Iceland's Krona. On another note the post by Edward touches upon some very interesting topics especially the perspective of how the "traditional" global imbalance narrative of US' CA deficit goes along with the demographic imbalance argument. My question then is that if the Euro or Yen are not up for it in terms of forcing a correction of the dollar what currency is, the rmb or the rupee? Moving on we have a theory or at least a thesis on our hands on how demographics affect the global economic imbalances ... but would I be wrong to say that the dollar correction eventually will come and the longer time nothing happens the harder the fall? "is, the rmb or the rupee?" Nope, definitely not. This whole problem goes back to Bretton Woods I, and the idea of a reserve currency. As we can see there are limits to which the euro can become the reserve without hoisting its value and crashing Italy, and possibly sending German exports so low its growth goes backwards. But then the new economies are nowhere near strong enough or mature enough to support this kind of role. So the dollar is stuck with it. In the short term this, of course, has many advantages, it's the unwinding that will be the hard part. "would I be wrong to say that the dollar correction eventually will come and the longer time nothing happens the harder the fall?" No, I don't think you would. In the long run - but we could be talking about a decade or more - Brad is right, and the thing will unwind. And when it does, since all of this is very definitely non-linear, the ride will be very bumpy. At least that's my best guess. "The International Monetary Fund on Wednesday stepped up the pressure for far-reaching shifts in exchange rates, declaring that the dollar will have to depreciate “significantly” over the medium term if global economic imbalances are to be resolved in an orderly fashion." I guess this would be the point: "if global economic imbalances are to be resolved in an orderly fashion". I seriously question whether any such shifts are possible, especially in the medium term where Geramny Italy and Japan's problems can only increase not decrease. The IMF obviously mention the Asian currencies, but as the FT notes "it shied away from giving any specific figures as to the extent of appreciation required". My personal feeling is that they are wise to refrain from so doing. Clearly *some* Asian currencies can steadily appreciate, but at a rate which will not resolve the imbalances issue appreciably, others (like the Tigers) are themselves rapid agers, and will have their own issues. What you need to keep very clearly in mind here (IMHO) is not the relative sizes of the various populations, but the relative GDP values. "The IMF sharply increased its estimates for growth in Japan, to 2.8 per cent this year and 2.1 per cent next, declaring that the expansion there is now “well-established”." Of course, if the IMF are right that the Japanese expansion is now 'well established' then the picture begins to change, but I think there are plenty of grounds for serious doubt that it is, and if it isn't, then it'll be another kind of correction that we are about to see. I mean I think what I am saying is that many of these problems are fairly complex and hard to handle. Simplistic solutions, and platitudes (which is what I think the IMF are going in for) just don't contribute anything useful. If what you really think is the most important thing in the short to mid term is correcting the US CA deficit, then Bernanke simply needs to continue doing what he is doing and keep raising rates. In the short term this will push the dollar even higher, but as it grinds down growth in the US it will begin the correction in the CA deficit. The issue is whether or not you think the price is worth paying. Ditto the Federal Deficit, reducing this may or may not help the CA deficit, but it would reduce growth in the US, which would indirectly help, but only at the cost of making those who are already worried about a weak labour market even more worried. I'm relatively new to this site, so I was wondering if you could clarify what you mean when you say global demographic imbalances and their effect on CA imbalances. I'm assuming you mean that relatively aging societies (ie Japan, Europe)save more whereas less relatively aging societies consume more (ie US). Also, could you expand on your GDP/capita comment. In sort of related points - Most people don't talk about the military when it comes to talking about reserve currencies, but you'll notice that reserve currencies happen to be the currency of the dominant military power of the time, which I don't think is a coincidence. Also, Europe to me seems more fractured than the US. The individual states in the US rarely get involved w/ anything nationally, which isn't the case in Europe, and I consider relatively more destabilizing than the US model. In your last post you mention that raising rates is what the Fed needs to do to lower CA deficits medium term. I agree that would work, but it's never going to happen. The Fed's mandate is inflation and jobs. Putting people out of jobs to 'correct' an imbalance is politically infeasible, and IMO stupid. Why anybody would advocate recessions to correct something which is an arguable problem is beyond me, although I note that many commenters are of the opinion that the end of the world is coming because the Chinese own a bunch of treasuries and the American consumer isn't saving. "I'm relatively new to this site,"
"I was wondering if you could clarify what you mean when you say global demographic imbalances and their effect on CA imbalances." Well in some ways this is a fairly long and complex argument (and I guess in some part it is what this site is about). Basically I'm trying to understand why fertility falls, and what drives this, and since this is pretty hard work (since basically no-one does) I've been pretty bogged down with this these last months. This seems to me to be important, since without a model of what drives fertility (and its correlate longevity) macro theory really seems to me to be at sea without a rudder. Another way would be through Bernanke's global savings glut speech (or investment dearth one if you prefer). Basically I would argue that age structure has strong behavioural (productivity and spending/saving related) effects as well as important compositional (read dependency ratio) ones. This means that given that different societies are at different stages in their demographic transitions some countries grow more quickly and some grow more slowly, some save more, and some become net debtors, some have CA surpluses and others have CA deficits etc etc etc. It is the extent to which all this correlates with the age structure (and the median age) of a society which would be what all the debate is about. "I'm assuming you mean that relatively aging societies (ie Japan, Europe)"
First point, as you will se from my book intro, all societies (apart from 18 who are, for one reason or another going backwards) are ageing. The question is how far each has got in its ageing process. China has clearly got farther than India, and Ireland than China, and the United States than Ireland, and France than the United States, and Italy, Japan and Germany (with median ages around 42) the furthest of all. It is also very important to note that Europe is not homogeneous. Ireland still has near replacement fertility, France is not that far off, the UK and Sweden are not too bad, and then come all those 'serious cases with TFRs below 1.3. So it is very hard to simply talk about 'Europe' here, you need to be discriminating. Basically, all societies are ageing, but it is when the median age starts to climb over 40 that the important economic consequences appear to start. "save more whereas less relatively aging societies consume more"
To some extent this is the case, but there are still unknowns here as to whether societies when they age past a certain point may not start to seriously dis-save and even get into debt (if anyone is willing to lend to them that is). "Also, could you expand on your GDP/capita comment." Yep. Well this isn't such a complicated point really. China and India are really populous countries, and in this sense they are very important (nearly 40% of humanity live there) but they are terribly poor, and so their total GDP, and even more importantly their per capita GDPs are relatively small. So I just think it is not very realistic to imagine the Renminbi and the Rupee taking the currency strain in global financial markets. Not now, and not for quite a long time to come. So while there is certainly room for the value of the renminbi to rise, and this should be encouraged as the cost pressure will then push China more quickly up the value chain, the possible currency correction isn't going to solve by a long shot the US CA deficit problem. "The Fed's mandate is inflation and jobs. Putting people out of jobs to 'correct' an imbalance is politically infeasible"
Yep, well there you are, and this is why it won't be corrected, at least not in the short to mid term. Of course one day it will be. "Why anybody would advocate recessions to correct something which is an arguable problem is beyond me"
Well I certainly agree with you, it is beyond me too. But look around, plenty of people in the US are arguing that the imbalances are important and that they need to be corrected, they simply seem to feel that it is someone else who should be doing the 'correcting'. Look, basically if people in the US aren't saving I find it hard to blame the Chinese for this. The only remedy if you want people to save more is to raise interest rates, I think it's as simple as that. Now the problem is that you can't easily raise long term interest rates, because there is so much liquidity swimming around, in part because the ECB and the BOJ find it very hard to raise rates with all the ageing related saving that is going on. Here IMHO is the nub of the question. celand successfully auctioned government bonds for the first time in three months on Wednesday, but had to accept a higher yield than in previous sales, reflecting concerns about the country's overheating economy. The government debt agency sold IKr1.5bn (€15.4m) of four-year bonds at an average yield of 9.8 per cent. It accepted bids in its monthly auction for the first time since January 18, when the 2010 bonds were sold to yield 8.1 per cent. Wednesday's auction attracted demand worth IKr8.1bn from 20 investors. Beat Siegenthaler, strategist at TD Securities, said: "There is clearly strong interest in Icelandic assets at these yield levels." An alternative to Brad's thesis runs along these lines: the only currency whose rise vs the dollar can dissipate the imbalance is the renminbi, and it won't appreciate vs the dollar any faster than the Chinese central government lets it. The Chinese central government these days is nothing if not cautious, so this appreciation will happen slowly rather than suddenly. At the end of the day, a large pile of dollar-denominated debt ends up in Chinese hands. It is likely that some of it will be defaulted or inflated away. It is possible that the Chinese government has already determined to accept this loss as the necessary price of insulating the rapid capitalization of their country from the violent boom-bust cycles that characterized a similar stage of industrialization in other countries. "It is possible that the Chinese government has already determined to accept this loss as the necessary price of insulating the rapid capitalization of their country from the violent boom-bust cycles that characterized a similar stage of industrialization in other countries." Well yes, exactly. This is the Dooley et al argument. Cheap at half the price I would say in order to escape from poverty. The thing is China has no moral obligation to sort out the US CA deficit and private indebtedness issue, nor is there any good reason why it should have. The Chinese government's responsibilities are to its own poor citizens. But I would still stand by the point that a rise in the value of the renminbi to allow an orderly depreciation of the dollar to the tune of what, 20 to 30 % vis-a-vis the Chinese currency, is simply not a sustainable option. China is still too poor to support this. This type of correction will come one day, and everyone please note that when it does. then the relative living standrad of the Chinese will jump noticeably upwards, as will the dollar value of the entire Chinese economy. Thanks for your response. Too much to process now, as I'm at work, but I look forward to it. I've struggled to find much material combining macroeconomics and demographics, so I'm excited to find your site. The US CA deficit isn't really a problem. A CA deficit is really a surplus on capital account; the two terms are just the flip sides of the same coin. The US has had an inward capital surplus for most of its existance (nearly the whole 19th century, for example) and again since the 1970's. As for why capital currently flows in to the US, that's not a mystery. A) the US economy has grown faster than the developed-world average for nearly 30 years now, thus enlarging its share of world GDP and increasing profits. B) rates of return on capital in the US tend to be higher than in other places with similar growth rates. (Cf. the US and Japan). C) low political risk. Property is secure in the US in a way that it simply isn't in, say, China, where you can be stripped of everything by political fiat. It's also very liquid -- easy to realize and transport across national boundaries. what is icelands current demographice transition spot then?